Premature failure is a common fate for large-diameter (e.g., 8″ to 10′) bearings in heavy-duty applications where rotations are frequent. In big rotating equipment, such as cranes, excavators and tunnel boring machines, a slewing ring bearing must simultaneously handle a complex load spectrum that covers diverse combinations of thrust, radial and tilting moment loading. Fortunately, there’s an easy way to protect your investment in these custom-engineered bearings. 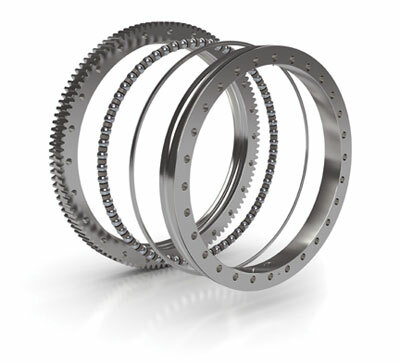 It’s called regular maintenance, and it can prevent 96% of slewing ring bearing failures. To maximize bearing life, simply follow these four tips – raceway and gear lubrication, torque checks on bolts, and seal inspection – and be alert for four warning signs of potential bearing problems. A bearing should be lubricated at regular intervals with heavy-duty, extreme-pressure grease. Apply a liberal shot to the fittings around the bearing’s circumference at the interval recommended in the operator’s manual. Slowly-rotating equipment or oscillating applications (e.g., backhoes, excavators, cranes) should be re-lubricated about every 100 hours of operation. More frequent lubrication – every day or even every eight hours – may be needed on equipment that moves rapidly or rotates continuously, such as trenchers and boring machines. While adding grease, the bearings should be rotated to spread the grease throughout. Pump it in until you see the old grease squeeze past the seal; this is called purging. Purged grease carries contaminants out of the bearing. Rub some between your thumb and forefinger… if you feel grit or metal chips, you may have a bearing problem. Grease tends to dry out over long periods of time, allowing condensation to form within a bearing. You can avoid this by introducing grease at least every six months, even when the equipment is sitting idle. Most large bearings have gear teeth that require lubrication, and those requirements are different than they are for the bearing itself. Since the meshing action of the teeth tends to squeeze out lubricant, gears should be lubricated every eight hours on slow-rotating or intermittently rotating equipment, and more often on rapidly or continuously rotating equipment. Small amounts of grease should be introduced at the point of mesh between the gear and pinion. The seals on the bearing should be visually inspected periodically to be sure they are intact. 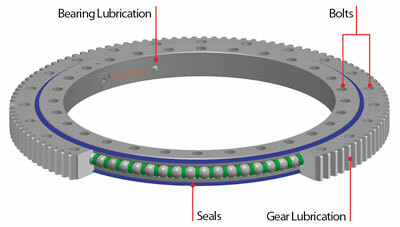 Many people overlook the importance of seals, but they aid considerably in preventing bearing raceway contamination. A torque check on bolts should be part of any routine maintenance procedure. The frequency of these checks depends on the severity of service. Vibration and shock tend to loosen bolts, but periodic torque checks and tightening will help maintain the proper preload level. Mounting bolts should be torqued to the proper level and checked periodically to ensure proper pre-tension. Improperly pre-tensioned bolts can fail, causing damage to equipment and, even more importantly, injuries to workers. Bolt creep is another factor that should be monitored. Tightened bolts tend to creep or elongate over a period of time, reducing preload. Elevated temperatures can also increase bolt creep, so take this into consideration when developing a torque-check schedule. Regular maintenance goes a long way toward preventing premature failure, but even the most faithfully maintained bearings will eventually show signs of wear. To extend their life, look for these common signs and take corrective action as indicated. Play or clearance in the bearing often signifies that a raceway is worn. A new bearing is assembled with a specific amount of clearance to compensate for slight out-of-flatness in a mounting structure. Wear can increase this clearance dramatically. In machinery with a boom, free play magnified over the length of the boom allows it to rock back and forth under load, reducing the ‘stiffness’ in the extended boom. Check bearing clearance with a dial indicator that measures how much the structure tilts when the boom is loaded. Grinding, popping, or clicking noises from the bearing typically mean there could be inadequate lubrication and/or excessive wear in the raceway, or loose bolts. As noted previously, greasing the bearing and purging lubricant is a good way to check for metal particles. An increase in torque or binding can mean uneven wear in the raceway. If the turning torque of the bearing increases substantially or the bearing has tight spots, the load is probably unevenly distributed. With excavators, for example, the operator may sense a resistance to swing and find that the upper boom swings an inch or two past the point where it should stop. In advanced stages of wear, the bearing will pop and crack as the machine digs and swings. Dimpled raceways are typically the result of overloading the bearing or repetitive, heavy loads. Even slight overloads can dimple a bearing race, and a dimple that starts at 1/1000th of an inch will almost always get bigger. The same goes for uneven loads. Lifting with a boom and undercarriage in the same position every time (such as curbside digging with an excavator) can dimple the bearing race near the uneven load. If possible, change the angle of approach from job to job. By monitoring the symptoms of bearing wear and doing regular preventive maintenance, you can significantly reduce the chances that a bearing will fail prematurely. This in turn minimizes expense because it keeps equipment working productively, avoiding breakdowns that lead to costly downtime and repairs. El Equipo de Servicio de Sistemas de Alineamiento de PRÜFTECHNIK ha recibido un interesante encargo de una central hidroeléctrica en el rio Isar. Se ha encontrado una huella de desgaste en el casquillo de una turbina tipo Francis y en su generador asociado y PRÜTECHNIK ha sido nombrado el encargado de identificar la causa principal.